At present, the evidence suggests that life may have existed in the past on Mars, or not. However, the scientific consensus is that we assume life never arose on Mars, and will continue to do so until evidence pops out and bites us in the mass spectrometer. There is no evidence of life on Mars right now. Those could be mineral deposits that formed in mud in the absence of any living organism. NASA’s info on this find is here. On a planet with life, these look like some evidence of that life. On a planet that never had life, these look like natural mineral concretions. But if only life could be so simple! In my own personal experience, these look closest to iron or manganese (or both) deposits that form in bogs. However, that does not mean that they look to me like natural concretions, because I’m pretty sure that those bog deposits occur with the help of bacteria. In other words, trying to figure out what these Martian items are by reference to “natural mineral concretions” on Earth is going to be more problematic than people may be thinking, because such mineral concretions are often signs of life on our planet even if they are not, themselves, specifically, direct fossils or traces of living organisms. But here is the thing that I find interesting: The chances that this photograph represents life on Mars is either very high or very low in the eyes of a given observer depending on the answer to this question: How likely to you think life is to begin with? If you think life is very likely to emerge where there are things like sunlight or a chemical source of life-usable energy, and liquid water, is very very high, then we can be pretty certain that Mars at one time had life, and we are simply waiting for NASA to find it. It would be a surprise to NOT find it eventually, and since evidence absent is hard evidence to parse without resorting to useless aphorisms, we’ll just have to wait a long time before giving up on the idea. Alternatively, if you think that life is very unlikely to get started given the basic raw materials, so that what we have on Earth is special and rare, then you should be very agnostic about anything that comes along in the way of lifey-looking stuff from the angry red planet. But here is the other thing. Which way a particular individual, especially a scientist and especially a NASA scientist, is actually going to break on this has less to do with gut feeling or understanding the origin of life or any of that, than it has to do with worrying that people are going to think you are nuts. Scientists will remain publicly agnostic about life ever existing on Mars. They will become annoyed at anyone that suggests otherwise, but they will always leave the possibility open. They will give a little more wiggle room for a singe celled bacteria like form of life, and bridle at any suggestion of multi-celled life (if these are “trace fossils” that’s multi-celled life, if it was Earth). They will also get mad at anyone who discuses life on Mars mainly in terms of multi-celled life, as thought such an interlocutor was dissing the poor Martian bacteria. Which we shall remain agnostic about. Then we’ll find definitive evidence of life on Mars. It may be bacteria-like, or it may include colonial or basic multi-cellular forms. Or something else. Whatever. Then, since the two planets we a) know about and b) can reach, have evidence of life, we’ll thereafter assume life is easy, as it were, and widespread in the Universe, and eventually, only historians will remember when we thought differently! I just hope that those squiggles aren’t dirt that fell out of the Mars rover’s treads as it went by this site at an earlier time. I fall into the very likely camp. I’m also partial to the panspermia concept. The idea that out of the roughly 10^24 stars in the universe Sol is the only one that has a planet with life on it strikes me as verging on the absurd. I remember ALH2004. I’m sure NASA does too, so I expect them to be cautious. AKH2004 is probably evidence if life. The problem is chain of custody. Other than something waving at the camera, what are the current bots on Mars capable of finding that would convince a skeptic that life did exist on Mars? It seems unlikely that they could discover fossils, tracks or other sign, so what could be the telltale clue? I think the clincher nay cone from isotope chemistry. 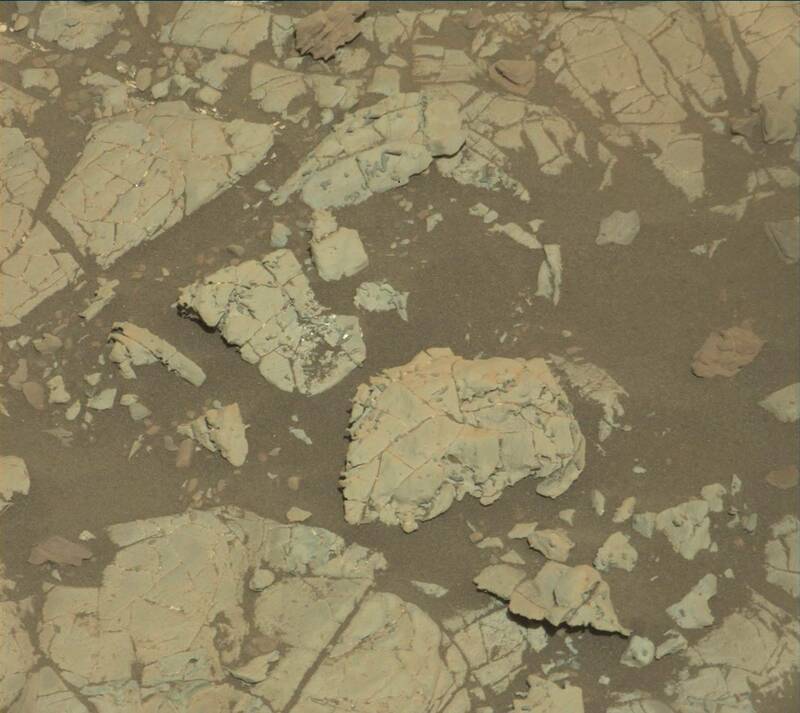 If Martian life is in the past, then what is needed is probably old sedimentary rocks. I haven’t kept up with Martian “geology” but unless some great impact has excavated some old rock without pulverizing or melting it, I don’t think there is any evidence of Martian tectonics involving great uplift followed by erosion that would expose such old rocks at the surface. If there ever was life on Mars in the past, doesn’t it seem unlikely that there is not life there now? What sort of event could completely sterilize an entire planet even deep into the soil and bedrock? Further, wouldn’t such an event be likely to leave some sort of evidence of its occurrence? Some informed, imaginative musings are in order. If it was ever present, how far Martian life spread out in time and across the planet depends on how long conditions favoring its survival lasted. If life was localized rather than widespread, there would be no traces in most soils or bedrock. The term “bedrock” does not imply any great age. On Mars, much bedrock is likely to be volcanic lava eruptions since the time that life is mostly likely to have been present. 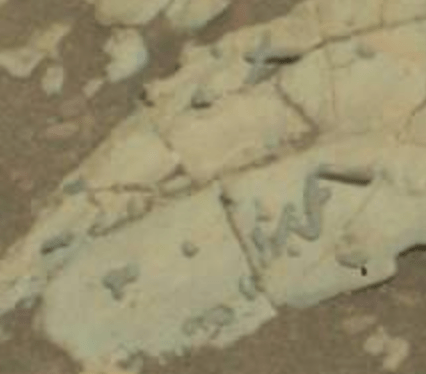 Older bedrock may be exposed on Mars but only in cliffsides which rovers cannot sample. Large natural exposures of old rocks on Earth are mostly the result of active tectonics and erosion. Mars seems deficient in the right kinds of both of these. Even on Earth, where conditions favor life, the rock record is not rife with fossils until about 600 million years ago or so (beginning of the last 13% or so of Earth’s history) and much of what has been found was found only recently in a few places in the form of possible microscopic cells. Stromatolites, structures produced by microscopic lifeforms even today, have been found in very old Earth rocks but I doubt if Mars rovers are equipped to search for either cells or stromatolites. Even with all that, Martian life is still worth looking for. Humans spend a lot more effort and money on much more trivial things than that. active site of an enzyme found in Thor has 4 residuals having side chains with pKa values of 7. 0,8.0, 9.0 and 10.0 respectively. The side chain of all these 4 residues need to be fully promoted for 100% activity of the enzyme. What integer value is close to the pH at which enzyme will be 50% active?